The correlation between psychic abilities and background music has been noted many times. 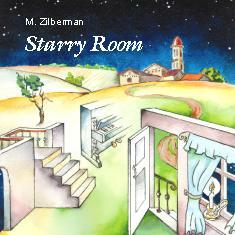 This page lets you preview several tracks from the "Starry Room" album recorded by parapsychologist and author of Intuition Tester, M.Zilberman. Zilberman is the author of many publications in the field of intuition development, and has undertaken extensive research on the influence of environmental factors on human psychic abilities. (Please see Scientific Background for details and references). He is also the composer of music for piano, synthesizer and small orchestra. Album "Starry Room", which we present here, includes some of these compositions. and who value the beauty of nature, music, and humanity. "Starry Room" contains nine compositions, which you can use to "submerge" you into a specific mood before you start the psychic testing. You can also listen to the music during your psychic tests. Intuition Tester can help you find out which kind of music stimulates your psychic abilities most. Here are also links to 2 excellent videos, which may help you to explore your paranormal potential. FREE preview of "Starry Room" tracks. a. Left-click the composition you want to preview. b. Right-click the composition, select "Save Target As..." menu item, download track to your PC and play with .mp3 player.